Some upbeat economic data from the US and a rebound in Chinese shares helped ease market tension today. Volatility measures including the VIX and Euro VIX (EVC) dropped off considerably as risk aversion fell back to more orderly levels. The US economy grew much faster than expected in the second quarter according to revised figures released by the US Bureau of Economic Analysis. The latest data put growth at an annualized 3.7 percent in the period April to June. This was much higher than the 2.3 percent based on earlier figures. The upward revision was down to higher consumer spending, exports as well as government spending. Imports were also lower and inventory levels had been underestimated. A separate report from the US Department of Labor showed a fall in the number of new job seekers. People seeking unemployment support for the first time, the so called initial jobless claims fell to 271,000 last week. That was a fall from the number of 277,000 one week earlier. Overall markets took the data in an extremely positive light. The US economy, in better shape than previously thought, will be better placed to cushion the impact of a slowing China. Analysts also increased bets that the US Federal Reserve just might see scope to raise interest rates this year. September however looks extremely unlikely given the Fed’s mandate to maintain financial stability. A move in rates now would look ill-judged. The benchmark US dollar index rallied for the third day in a row and is now trading at 95.84. Euro, yen and sterling all took heavy losses as the greenback drove higher. Bucking the trend however was the Canadian dollar. The “loonie” rallied back to 1.3194 from 1.3350 a day early. The move followed a bounce in crude oil prices which took futures up over four dollars on the session. 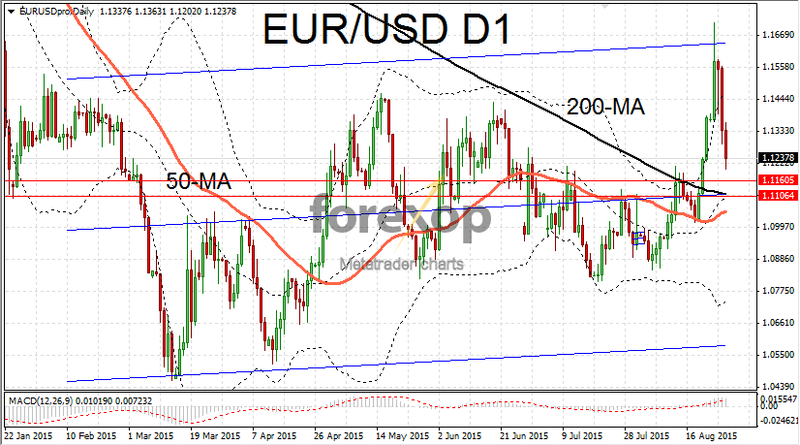 EUR/USD fell way back to 1.1237 – a huge movement given the pair was trading above 1.17 at the beginning of the week. 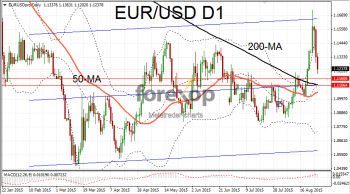 EUR/USD is descending towards the key resistance/support area between 1.1106 and 1.1160. The slide began early in the Asian session and accelerated after the US GDP data and jobs figures were released. On the hourly chart EUR/USD is oversold according to both the RSI and the MACD indicator.